We are confident that the School of Biological Sciences at Bristol gives you that value and delivers an education of the highest order. A consistently high satisfaction rating in the National Student Survey (averaging 94%, up to 98% in 2011) supports our belief that we are achieving the high educational goals we set ourselves. Our staff have diverse research interests across the biological spectrum and we transmit our passion for the life sciences to our students; this is what research-led teaching is all about. Lectures (each of 50 minutes) provide the information and, most importantly, understanding and insights into each subject. They are also the foundation for further private study. Every student is assigned a personal tutor whose role it is to monitor their progress and to help deal with any problems that they may have. Tutorials in which small groups of students meet on a regular basis with members of staff, provide occasions to explore the subject in a more informal setting, and involve preparation of material for discussion, often by means of essays. Our units are assessed through a combination of continuous assessment and examinations. Continuous assessment at Year 1 and Year 2 comprises practical and tutorial work, whilst at Year 3 it is assessed separately in the field course, practical and library project reports. Work in your second year counts towards 25% of your overall mark. The rest of your marks come from your field course report, the research project, library project/critical review and final examinations. Throughout the three years students also undertake special assignments linked to specific units. These introduce students to the biology of organisms and the techniques used in their study in a practical context. Practicals last three hours and may be laboratory, field or computer based. Practical work is often undertaken with other students in pairs or small groups. In their final year students complete a research project, usually in pairs, supervised by a member of staff. A wide range of project titles are available every year and these are linked to our research. This independent research project is an opportunity to conduct a novel piece of scientific research; a number of projects produce results that have been published in leading scientific journals. Field work is a major and popular part of biological training. As well as field trips as part of some units, all students attend a formal field course in the second year of their studies. We offer a wide range of options ranging from overseas to UK, and residential or Bristol based. 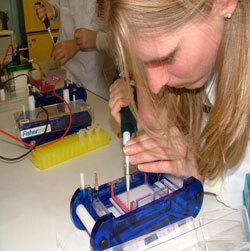 We also offer a molecular genetics option for those interested in more laboratory based science. Courses are usually small, 12-30 students, and are taught with a high staff to student ratio. See details of potential field courses that may be running during your time studying here. In addition to the formal training these courses provide, many of our students have gained further experience by organizing their own scientific expeditions whilst at university, usually in the summer vacations. In the last few years student expeditions from the School of Biological Sciences have visited the Comoros, Venezuela, Columbia, Borneo, Indonesia and Ecuador. These expeditions have received support from a variety of bodies, including the Royal Geographical Society, and some have received international awards from conservation organizations in recognition of the scientific importance of their findings. I like the fact that the lecturers are experts in their field. They’re very enthusiastic and encouraging and this is reflected in their teaching.